Think PR is Only For Putting Out Fires? Think Again! There’s this off-handed idea that you only need public relations if you or your company has made some type of mistake. Kind of how no one knows about a celebrity’s PR rep until they’ve done something wrong - like cheated, lied, stolen, etc. Nowadays, that’s no longer the case. You don’t only want to be seen when something goes wrong and you have to fix it. 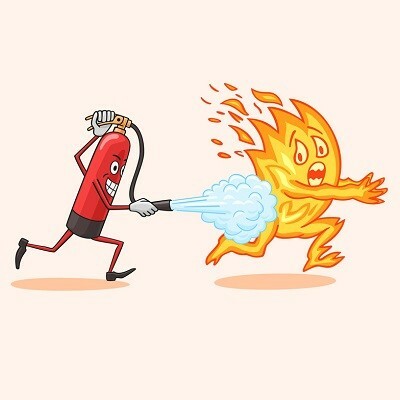 The trick with public relations is to put enough flame-resistance out there beforehand to help lessen the intensity when something does go wrong. Your public relations are the only way you can have any control over public opinion, so you need to be sure to implement a strategy along with your marketing. The first step in making sure your PR efforts help your marketing is to make sure you understand the role of public relations. PR includes any activity that is designed to improve communications and build relationships with any audience that matters to your business. So any public speaking, media relations, employee relations, community relations, etc, would fall into the realm of public relations. PR is one of the most cost-effective methods of marketing and is quite valuable, especially to those businesses with a limited budget for publicizing and advertising, both services and products. Implementing a PR plan, alongside of your marketing strategy, enables you to establish your brand identity in a practical manner, helps you market your business and reach out to the public, all without breaking the bank. Public relations is how you show people not only that you exist, but that you’re an awesome company to work with and be a part of. Staying consistent throughout your PR efforts helps to build awareness of your products and services, while showing that your company is also consistent and reliable. If you do cool things in your organization, make sure people know about them and if you do volunteer work in your community, make sure it’s reflected in your PR strategy. Things like Puppy Tuesdays or Crockpot Thursdays, and events like volunteering at a local soup kitchen, or conducting bottle drives for your community are great for PR. You should be sure to share pictures or videos of these events on your social media platforms, in blogs, or on your website. If you’re participating in a community help event to raise money for something, have your team coordinate with matching shirts or name tags, so people recognize your company almost instantly at the event. This can also be supplemented in your direct marketing and advertising efforts, which can help boost your SEO rankings overall, making your business easier to find. You do want to be sure that you're not only creating awareness but that you yourself are aware of any counterproductive behaviors happening in and around your business. Being vigilant to these potentially damaging behaviors and perceptions will give you the upperhand when it comes time to put out those fires we discussed before. The visibility that comes with good public relations, also tends to make your business appear larger and more established than it may be, which may help you secure more partnerships, customers and funding. When we see third party coverage of a product or service, it is perceived much differently than a traditional advertisement. We know we’re just a target when we see advertisements, but when a third party, such as the media or a colleague, endorses a product or service, the company gains credibility. We as consumers are much more likely to make a purchase based on third party endorsement, because it is someone’s genuine opinion, rather than a paid push in that direction. Not only can you develop new relationships with customers, but you can develop your relationships with current clientele, investors, etc. Positive media coverage, including shares and retweets on social media, especially that which is unpaid, goes a long way with most people. While you’re glowing from your positive public relations spotlight, you’re quite possibly also attracting new employees. People, especially employees, want to feel like they’re important to their bosses and that what they’re doing every day matters. If you’re employee relations are up to par, then it will be reflected by your staff. We’re not suggesting that everyone get a medal or a trophy each day, but something as simple as a, “Hey, I really appreciated/enjoyed/liked/etc that proposal you came up with”, can go a long way. Having employee appreciation events or company outings, demonstrate to the public that your company culture could very well be something that new people want to be a part of, all while strengthening the loyalty of your current staff. Initially, public relations was given a bad rap because it’s more difficult to track than regular marketing efforts. Nowadays, however, modern public relations professionals are getting better at building strategies that help expand reach, increasing sales conversions, driving website traffic and enhancing customer loyalty. This is why it’s not only incredibly important to make sure that you have a PR strategy, but that you understand it too, so that your business isn’t left in the dust with traditional, outdated marketing. Need help boosting your business' marketing with some PR? Let’s talk! !